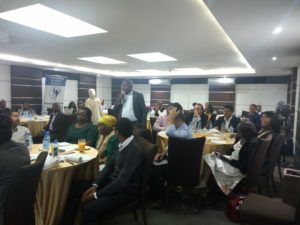 Kenya Healthcare Federation held its second members meeting on 22 march 2018, at Four Points Hotel by Sheraton in Hurlingham. 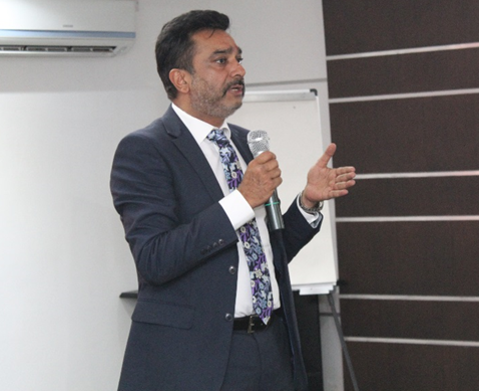 The meeting was chaired by Dr. Amit Thakker -Chairman KHF, in his opening remarks, he advised the members to pay key attention on various presentations so as to obtain the ‘HOW’ to unlock partnership with the Counties. This is because counties have been allocated Ksh. 191Million and 88% of it is allocated to Healthcare. He further emphasized that each county is to present a Business Case for Healthcare which should be used by the year 2020 and tripled thereafter. Dr. Amit Thakker addressing the KHF members during the Bi-Annual meeting. The meeting majorly focused on updating the members on the Kenya Coordination Mechanism (KCM) progress with the Global Fund (GF). GF has been working with Kenya Coordination Mechanism (KCM) whose mandate is to mobilize funds from the GF for HIV/AIDS, Tuberculosis & Malaria programmes & to coordinate and evaluate implementation of the global fund grants. HIV /AIDS, Tuberculosis (TB), and Malaria are three major global Public Health threats that undermine development in many countries worldwide. Close to five million people die every year of these illnesses with substantial humanitarian, economic and social impact. GF as a financial institution, provides support to countries in response to these three diseases. However, it’s main purpose is to increase resources to fight these diseases and to direct those resources to areas of greatest need. GF granted Kenya towards fighting these diseases or bring them under control. From this grant, the 2017 – 2022 strategy was drafted which will majorly focus on maximizing impact against HIV,TB and Malaria, build resilient and sustainable systems for Health, promote & protect human rights & gender equality and mobilize increased resources. Kenya has made a great effort towards fighting these diseases. In that, The Ministry of Health (MOH) has prioritized the fight against, these diseases and remarkably, has continued to meet its obligation of GF co – financing requirement of 20% more to this, patients are able to access diagnostic treatment & prevention services and commodities for these diseases at no cost. The National Government has allocated Ksh. 10.2 Billion to support intervention of these diseases in Kenya for the year 2018 – 2021. The ICT and Mobile Health Committee will majorly focus on ensuring that Healthcare ICT space is an enabling environment for solutions, Understanding regulation i.e. educate stakeholders, create awareness of the existing regulations and share available data, Engage the regulators, associations, insurers, providers and suppliers, Analyse e-Health strategy policy guidelines by MOH – ICT unit and participate in the Health Act 2017 implementation process. More to that, the committee will make access to information easier, Increase access to health using ICT and approaching the MOH as an organized group representing the private sector voice. The Public Private Partnership (PPP) Committee will prioritize identifying suitable PPP models, Engagement in PPP Act to understand indepth what PPP entails and pursue an Engagement with County Health Government. The Healthcare Financing Committee (HFC) will major on Universal Health Coverage, Capacity building and Payer provider relationship. The committee will ensure that under Universal Health Coverage, All people and communities have access to quality essential Healthcare services that is affordable without financial strain. The supply chain will venture more effort on pushing the support of Local Pharmaceutical Manufacturers. “Non Communicable Diseases are on the rise and majority of the patients are not able to keep up with the medication because they are costly Kenya has capacity to produce good quality medicine but still imports more than 80% of medicine at high prices. This imports are of sub-standard quality. Local manufacturing is one of the presidents big 4 Agenda and this local medicine will be 5 times cheaper than imported medicine and of better quality. However, Public hospitals import branded instead of generic products yet Local Manufacturing is the solution to make medicine cheaper in Kenya.” Rolando Sateke – CEO Cosmos. The Health Regulations and Quality Standards Committee (HRQS) emphasised that there has been a misunderstanding between accreditation and certification of an organization. Kenya Healthcare Federation aims to clarify this while ensuring that Health services offered are of good quality as recommended. Through Doris from Kenya National Accreditation Service(KENAS), HRQS was able to clarify on the functions of the two bodies as; accreditation ensures that and organization is competent to perform specific functions in a reliable, credible and accurate manner, while certification means compliance with a standard or specification. There are major benefits of Accreditation such as quality improvement in internal operations, safeguard credibility of results from conformity assessment activities and improved market image. There was a joint agreement on improving and strengthening insurance especially NHIF to ensure all citizens are covered irrespective of their geographical location and financial status. 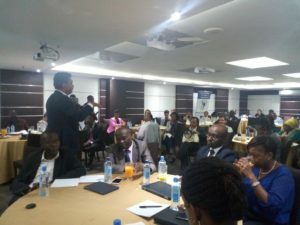 Moreover, members suggested that there should be equal distribution of medial specialist in all 47 counties, this is because many specialist doctors are concentrated in Nairobi County hence the patients have to travel to Nairobi to seek specialist medical attention and better medical investigation such as X-rays and Laboratory. Many patients are not able to access specialised medical attention because the medical specialist are concentrated within Nairobi. This becomes strainous because they have to travel and incur a lot of expenses moreover, there are less medical equipments for X-rays and Laboratory, this forces the patients to travel to Nairobi for better diagnosis. The meeting was well attended by 77 members, who included KHF member, CECs and Development partners.